Lift Products Moto-Cart Jr with Manual "Lift-Top"
Lift Products Moto-Cart Jr. is an economical solution to electric cart applications. It offers Transaxle drive and advanced roller grip controls. The 4-Wheel Moto-Cart Jr. has maintenance free batteries that are rechargeable with an onboard charger that runs on standard 115 voltage. The MCJR-LT features a foot pump which easily raises the platform to a convenient work height. 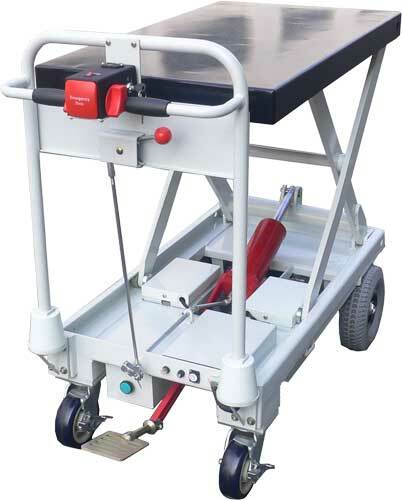 To lower the platform a simple squeeze of the control handle makes repositioning easy, and allows for the operator to set the height at any level they desire.